The answer is a simple yes, but it comes with a caveat: While there are several ways to officially diagnose cerebellar hypoplasia, not all CH cats have not gone through this process. Since cerebellar hypoplasia is a neurological condition, there is no way to be 100% sure that your cat has CH (as opposed to another condition) unless your vet verifies it with an MRI or other tests. Now, that can be quite costly, so most vets primarily diagnose CH through a process of elimination. That said, it’s always best to get a professional diagnosis from a veterinarian who is familiar with neurological conditions as there are other conditions that manifest symptoms similar to CH, namely unsteady walking and head tremors. These other conditions can be very severe if they’re not properly diagnosed early. Tragically, some involved in the CH cat community have learned too late that their “CH” cat does not have CH, but a life-threatening condition. Keep in mind that your local vet may not be familiar with these conditions. You may need the second opinion of someone who has more experience in this department. It’s essential to remember that a cat is born with CH. This means he has an underdeveloped cerebellum, which does not worsen over time. The damage has already been done once the cat is born. A CH cat’s abilities, if anything, may improve as your cat grows and learns to adapt. If your cat developed cerebellar hypoplasia-like symptoms suddenly, if the symptoms are sporadic, or if your cat’s symptoms are worsening, then it is likely that your cat does not have CH. If this is the case, take your cat to your vet and explain what has been going on. Detailed notes may help. While you can certainly request an MRI or other tests after adopting a CH cat, most owners opt not to for several reasons. One is because a CH cat adopted from a shelter most likely has CH. Depending on how long he was at the shelter or fostered, the staff or foster family have observed the cat enough to know if the condition is CH or something else. That said, many in the CH cat community don’t adopt CH cats from shelters but they come into our lives in other ways. No matter what, this cat or kitten should visit your vet, who may be able to confirm the CH. If you feel you need a second option or a sure confirmation, you can always opt to do that. The second reason is usually cost. Now money is a tricky topic. If your cat is healthy and not showing any abnormal characteristics (like sporadic or worsening symptoms), odds are you don’t need to run out to have an MRI done on your cat. 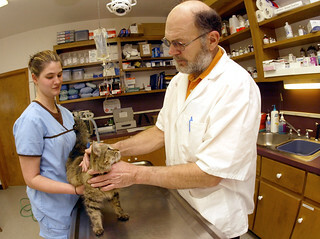 However, if it appears that your cat is worsening, it’s important to have them seen by your vet as soon as possible. Since insurance is not an option for most CH cats, you may want to consider these other money-saving options so that you’ll be financially prepared in case of an emergency. Riley has seemed more wobbly and unstable the past few days and I don’t know how to tell if he’s just going through a rough patch or if something more serious. He has also seemed more aggressive than usual the past two or three days but I don’t know if the two are connected. He has been so high functioning and so mildly affected that it concerns me to see him falling more often and just seeming generally more unstable. My dad probably won’t want to take him to the vet unless there’s something obviously serious going on but I was just hoping for the opinions of some of you guys who maybe have been doing this a bit longer. Riley is my first cat and is my first ever experience with CH so I’m still slightly lost. My first thought is that maybe Riley has somehow hurt himself? That would explain his extra wobbliness and off-behavior/attitude. Watch him closely to see how his movements are different. You may even want to call your vet and chat over the phone to see if he has any suggestions. Otherwise, if this keeps up, I’d recommend taking him in just in case.